Coconut seems oddly out of place in November, doesn’t it? There’s never been a shortage of pancakes with stuff mixed in. Just pop your head into a Denny’s any given Saturday – pancakes with blueberries, pancakes with banana, pancakes with walnuts or pecans – the list goes on. However, never before now have I seen anything like Trader Joe’s Toasted Coconut Pancake Mix. For some reason, no on has really bothered to mix tiny bits of crisped, sweet coconut into pancakes – and that’s surprising because the results are quite good. 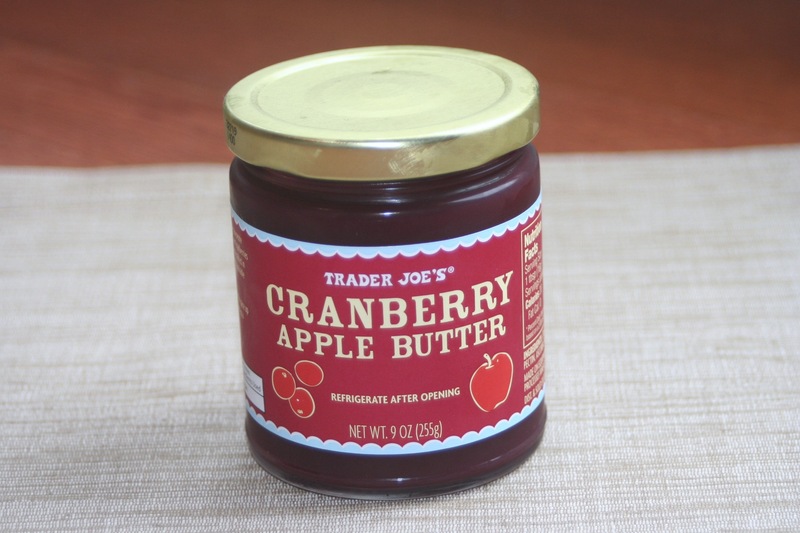 Trader Joe’s starts things off with an amazing new pancake mix. Instead of their ordinary buttermilk pancake mix that requires eggs, milk, etc, this new mix requires nothing but a little water. On to this they throw in a good helping of crunchy pieces of toasted coconut. The result is super easy to make pancakes with a natural sweet crunch to them. Pancakes are one of those delicious breakfast foods that everyone can agree on. And when I say everyone, I mean world wide. Some sort of pancake variation has been, at various points throughout history, invented indepedentently on every continent except Antarctica. From Ethopian injera to Tamil uttapam to Swedish pannkakor to the American flapjack, batter sizzled up in a griddle and served hot has become something of a worldwide staple. Of course though they may all share the name, the pancake varies widely from iteration to iteration. Sweet, savory, thick, thin, round, flat – the variations know no end. Here in the States, the main pancake question is whether or not you’ll be getting thick and fluffy ones, or thin, crepe-like ones. This can be a thorny questions, with fans coming down firmly in favor of both types. Trader Joe neatly side steps the issue by providing directions for both kinds of pancakes on the side of the box. In fact, TJ couldn’t make preparing these pancakes any easier. The mix is all inclusive, all you need to bring to the kitchen is the water, and the pancake mix does the rest – no eggs or milk necessary. Of course, this magical convenience is only possible because the mix includes dry, powdered milk and egg in the batter mix. While in theory these dehydrated and canned ingredients should be inferior to adding the real thing, in practice I found that the pancakes didn’t really suffer from it. In fact, these pancakes are just as good any you’ll get from any other off-the-shelf boxed mix. Depending on the proportion of water to batter you control how fluffy/dense your griddle cakes come out – from full-blown fluffy flapjacks to the paper-thin Swedish style and anything in between. What really sets this mix apart, of course, is the toasted coconut. Joe doesn’t skimp on this part of this mix, and you can expect every bite of your pancake to contain at least a touch of crispy coconut. The coconut does two things for the pancakes, both of them sublte. The first is that they add a bit of unexpected texure. After coming off the griddle the bits are postivley crispy, and give the flapjack a bit of extra, crunchy bite. This isn’t necessarily a big selling point, but it didn’t really bother me much either. In the end, these are perfectly ordinary pancakes with a little novel touch of coconut to them. How much that sells these for you depends on how much you like coconut. There certainly aren’t any flaws to the mix, but it’s also not something I would feel compelled to buy again just for the sake of getting a little more coconut in my breakfast. Out of everything the mix has to offer, it’s actually the ease of preparation that sells them the most. Being able to whip up tasty pancakes with just a bit of water was downright enjoyable. If TJ’s starts making more pancake flavor variations with this same mix I’ll happily pick them up. Until then, this box will probably last me quite a while. 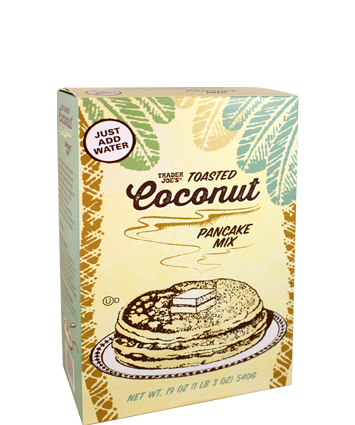 Would I Recommend It: Sure, the sweet coconut is a natural complement to the pancake batter. Would I Buy It Again: No, probably not. Final Synopsis: A novel and easy-to-make, but otherwise ordinary, pancake mix. 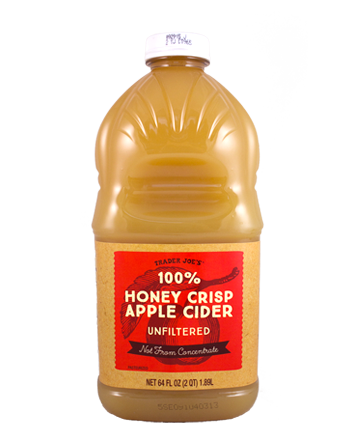 Holy-moly – Trader Joe’s 100% Honey Crisp Apple Cider is a dang good cider. I certainly love a good apple, whether straight off the tree or freeze-dried. Apples are, as far as I’m concerned the perfect fruit. Apples have it all – nutrition, sweetness, crispness, juiciness, an easy to store, easy to carry package, a pleasant shape and an appealing aroma. 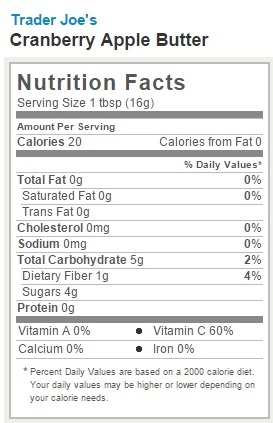 It’s entirely possible that apples are my favorite fruit of all time. Sure, I like me some mango, but that’s more of a tragic obsession than love. When it comes to the fruit you’d want to be married to, that’s an apple, no question. As much as I love apples, what I love even more is apple cider, that most delicious of all apple-based beverages. Why they even bother to make apple juice when cider is so clearly superior I’ll never understand. I’m sure some of you out there might be saying “Isn’t the line between apple cider and apple juice hazy at best, with no one authority having definitively establish the criteria for what separates apple cider from juice?” Well, that may be so, anonymous educated cider guy, but to paraphrase Supreme Court Justice Potter Stewarts‘ ruling on obscenity, I know it when I taste it. A better question might be, why should I buy this apple cider when Trader Joe’s standard Spiced Apple Cider (and, to a lesser extent, pear cider) have always done me just fine? Well, friend, that’s what I used to say too. TJ’s spiced apple cider is delicious, could this cider really be that much better? Yes – yes it absolutely is. In fact, this is the best grocery-store available apple cider I’ve ever had. It may not beat a fresh pressed cup of cider straight from the orchard, but it’s close. The secret of the deliciousness is in its simplicity. 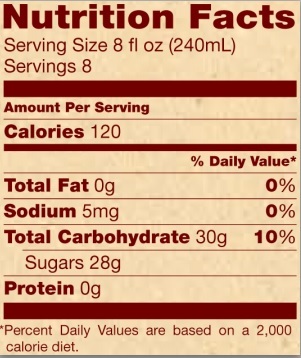 Take a look at the side of your jug of TJ’s spiced apple cider – you’ll notice that it’s adulterated with a variety of other fruit juices in addition to the eponymous spices. Now look at the side of Trader Joe’s 100% Honey Crisp Apple Cider. One ingredient – just one. Honey crisp apple juice. That, my friends, is a dedication to purity that you can taste in the finished product. Each cup of Trader Joe’s Honey Crisp Apple Cider is an explosion of deep, complex mellow sweetness, cut through with bright, tart notes. Any given mouthful is a flavorful journey into a country where the forces of sweetness and tartness war with each other. At any given moment one side winning out, in the next moment the other. It’s a hard fought war, but the victor is always deliciousness. If you ask me, this should be your go to cider for the rest of the season. I haven’t found a cider on the market that competes with the richness and intensity of fresh flavor that Trader Joe’s delivers here. If Autumn just hasn’t felt like Autumn to you yet, pick up a bottle of this today, and let the seasonal feeling seep into your soul. Would I Recommend It: Yes, this is some excellent cider. Would I Buy It Again: Yes – and I hope it will be coming back next year as well. Final Synopsis: A 100% pure apple cider with tart notes that does cider right. One thing that Trader Joe’s cannot be accused of lacking are options is the dried fruit department. I’m endlessly charmed by the lengths and methods TJ’s will go to in order to bring us a fourth type of dehydrated apricot, or a new way to make banana chips. However, even I was surprised by Trader Joe’s Crispy Crunchy Jackfruit Chips. For one, it’s weird to see such a massive fruit in such a tiny bag. The first time I encountered jackfruit in real life, I was shocked and a little taken aback, that fruit could get so big. How big is it? Big enough that I was momentarily afraid I had been shrunk to the size of bug. A fully mature jackfruit can be up to 3 feet long, weigh up to 80 pounds, and grow in bunches on trees – meaning they straddle the line between fruit, and natural hazard. Your average jackfruit could kill a horse if it happened to drop at the right moment, helped along by the fact that they are covered in spiked, armored plates – as if Nature decided to stop screwing around after this pineapple thing. It’s rare to find a fruit where two, stacked on top of each other, could beat me in a fight. Despite its relative obscurity here in the West, jackfruit has been a staple in India and South East Asia for thousands of years thanks to its size, resiliance and versatility as an ingredient. Like papayas, jackfruit are used for much more than simply a sweet snack. It is roasted, added to soups, fried into cutlets, mashed into kati and otherwise eaten all over the placed. In fact, jackfruit is so adored that it’s the National Fruit of Bangledesh. 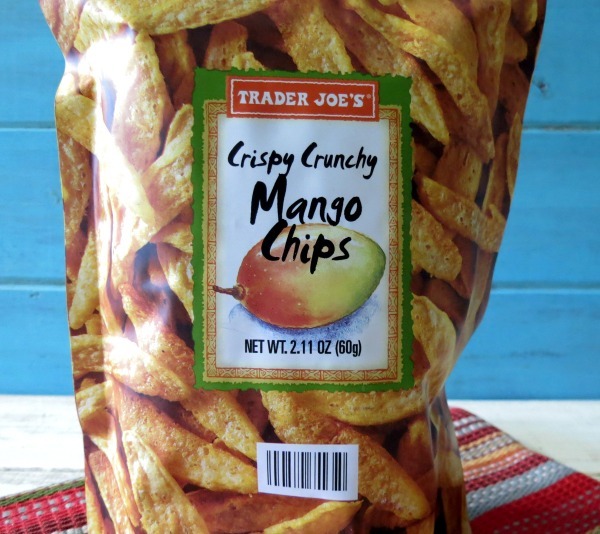 It’s not surprising, then, that Trader Joe’s got the idea to dehydrate them into chip. After all, that’s been a popular snack throughout South East Asia for many years. In their natural, raw state the jackfruit tastes something like a banana crossed with a very mellow mango. By drying jack fruit out, Trader Joe’s reduces this flavor profile greatly. Regardless of the exotic origin and taste of jackfruit, what we’re encounter here is basically a nice-sized banana chip. 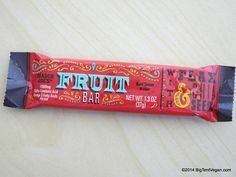 It may be a hint sweeter, and there are subtle tones of mango and pineapple hiding in the background, but these more exotic flavor are not nearly pronounced enough to over power the starchiness of the chip. It’s the size and softness of the jackfruit chips that makes them most different from banana chips – each piece is a mouthful, and they yield rather more pleasantly to the tongue than the brittle banana chip. One other thing the jackfruit is famous for is its trade mark odor. Fortunately lost during the dehydrating process, the fruit is generally described as having an unpleasantly overripe musk often compared to smelly feet. Overall, it’s only subtle touches that set these jackfruit chips apart. If you’re a banan chip fan, these will be interestig to pick up by comparison. 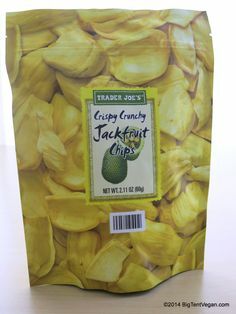 If you’re looking for a fresh new taste, however, something exotic to tingle the tastebuds, Trader Joe’s Cripsy Crunch Jack Fruit chips aren’t going to blow you away. That left me a little disappointed, but not defeated, so I went looking for a recipe that could give second life to this otherwise limited snack chip. I may or may not have found it. The recipe below is for traditional jackfruit bonda – a type of small, South Indian snack dumpling. Ideally you make these by grinding fresh jackfruit into a paste but, dammit, we just don’t live in an ideal world. Until TJ’s starts stocking their shelves with smelly, 80 pound monster fruits, I guess I’ll just have to make do with their jackfruit chips instead. 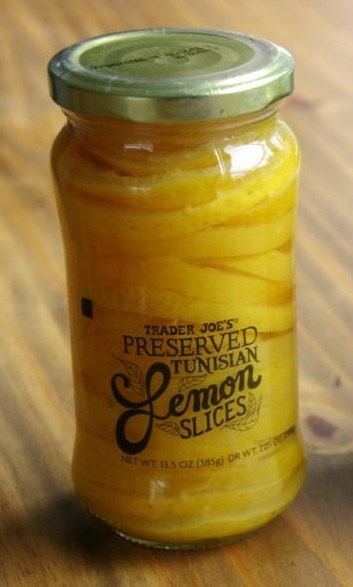 The concept behind re-purposing this recipe is to somehow reconstitute the dehydrated jackfuit chips with a bit of water (or juice) in order to create a paste. This paste is then, conceivably, used to cook with. Unfortunately, my food processor couldn’t manage the task and I was left with an unusable slurry. Next time I’ll try taking a mortar and pestle approach, and pulverize the jackfruit chips before trying to reconstitute them – so stay tuned for that! In the meanwhile, if anyone has more luck with this recipe, please share with us in the comments! Combine jackfruit paste, sugar, farina, coconut and spices. Heat up a frying pan, fill with oil, and start frying the suckers. Notes: Real bondas should be made with jaggery and rava – two Indian ingredients that I barely understand and can’t get into here. Instead, I substituted brown sugar (for the jaggery) and cream of wheat (for the rava). Both of these substitutions will probably piss off anybody who makes real bondas, so be careful. Would I Recommend Them: Not really, these weren’t much better than banana chips. Final Synopsis: Like banana chips, but a little softer and a subtly more exotic tasting.